1.2 What is the Ultimate AW User Guide? 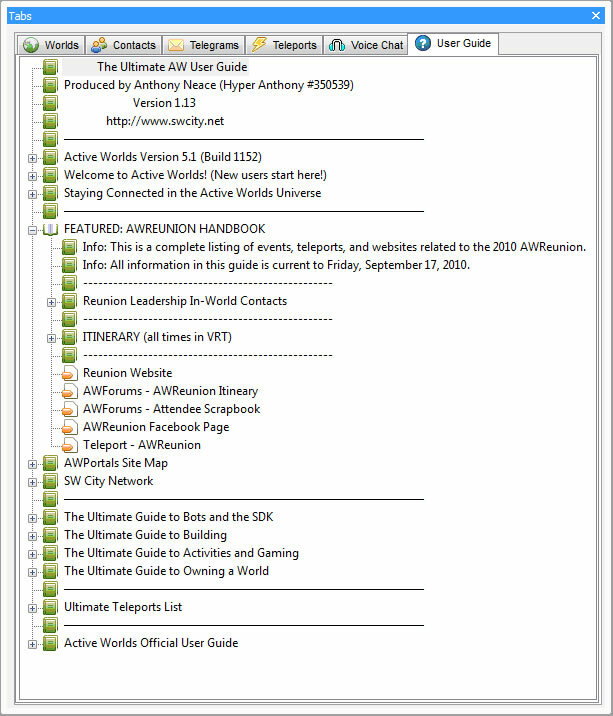 The Ultimate AW User Guide is a modification made to the official AW User Guide which enhances it by adding newer, more relevant categories and new features such as wiki inclusion and a comprehensive teleports list. It is easy to install and free to use. It is also simple to customize for your own needs. This takes the place of the existing user guide, which may be found in the AW tabs menu by pressing F9 and looking under the 'User Guide'/'Help' tab. Collapsible folders containing information and links. Integration of most informative links to the ActiveWiki to allow for easy, real time updates to the information presented to the user. Useful in-browser links for SW City Interactive Players. Easy access sub-forums to AWG downloads. Comprehensive guide concerning Bots, Utilities, and the SDK. Gives users a base for learning how to use and maneuver the SDK. Includes useful reference section in the SDK category. Includes links to all single/multiple use bots I could find. Comprehensive guide concerning activities and games in the Active Worlds Universe. Includes weekly events and gives in-guide information as to their whereabouts and times. Each Gaming World is given its own section with teleports and important links. Gives users a step-by-step, structured listing of important building topics, where to learn how to build, etc. Includes all aspects of object scripting. Breaks specific topics down into order of difficulty. Lists and defines the Public Building Worlds. Detailed World Administration section; includes definitions for world features and rights. Detailed explanation of World Hosting and lists available world hosts. Detailed Object Path listing -- includes free downloads and lists 3rd party sources. Includes Alphaworld, AWTeen, Yellow, Winter, and other PBWs. Gives simple information for each area listed. Includes wiki links or web links to most areas. Includes teleports to reference yards. Highly comprehensive listing of SW City sites. Original AW User Guide for reference. Replace default.awh with the default.awh file in the zip and restart Active Worlds. This also applies if you wish to install a new version of the Ultimate AW User Guide -- always replace default.awh! If you want to keep a backup of the old default.awh, you may rename it and leave the renamed file in the Help folder. Kenneth - Suggesting the World Owner guide. Or alternatively, e-mail me at hyperanthony at gmail dot com.